With some exceptions, most men who are imprisoned return home. Reentry is the dynamic process of exiting prison and returning to a free society (Visher & Travis, 2003). Although this can be an exciting time for some families, it can be a fearful time for others (particularly those whose partners have a history of domestic violence). There are a number of challenges that men and women need to anticipate as men attempt to resume their roles as husbands/partners and fathers. The reentry experience for each inmate is shaped by his pre-incarceration history (e.g., substance abuse, domestic violence history, job skills and experience); his prison experience (i.e., mental and physical health status); and his attitudes, beliefs, and personality traits (Travis, Solomon, & Waul, 2001). This section focuses on common obstacles to family well-being, including role renegotiation, negative emotions, relapse, interpersonal conflict, and the threat of domestic violence. Married men who reside with their wives and children upon release from prison have a more successful transition. Inmates frequently look first to their families to meet their immediate needs for money, housing, and emotional support (Fishman, 1990; Visher & Travis, 2003). 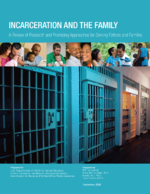 The majority of prisoners being released report feeling close to their family, and 70% of the men in the Ohio Returning Home Study expected to live with their family upon release from prison (however, in this study the definition of family was not restricted to partners and children) (Visher, Baer, & Naser, 2006). Research suggests that married men who reside with their wives and children upon release have a more successful transition (Visher & Travis, 2003). Although families play a substantial role in the reentry process, the criminal justice system does little to prepare families for their reunion (Fishman, 1990). Very little research is available to reliably document the process of reintegrating into the marital/partner relationship at reentry. What we do know about this process comes from small qualitative studies of men who were imprisoned and released and their partners (Fishman, 1990; Hairston & Oliver, 2006). Thematic summaries from these qualitative interviews and focus groups suggest that reintegration often starts with a “honeymoon period,” where the couple gets reacquainted. Many women feel optimistic that their partner will fulfill the promises he made while in prison with regards to stopping his criminal behavior. However, numerous conflicts may arise as the couple attempts to reorganize their lives and reestablish their roles within both the relationship and the household (Fishman, 1990). Recreating a sustainable family process that acknowledges the inevitable changes that take place during the period of imprisonment is one of the most challenging tasks that prisoners and their partners face upon release. One issue identified in the available research involves power struggles and renegotiation of roles. Ex-inmates who have been forced into dependency during their imprisonment may seek to assert their own power and control within their family upon return. However, women who gained independence and self-sufficiency during the time on their own may desire more egalitarian roles and struggle with their partner for control (Travis, McBride, & Solomon, 2005). On the other hand, men and women who desire traditional roles in their partnership may feel thwarted if the man has difficulties finding employment and establishing himself as the financial breadwinner (Fishman, 1990). Recreating a sustainable family process that acknowledges the inevitable changes that take place during the period of imprisonment is one of the most challenging tasks that prisoners and their partners face upon release. As couples seek to recreate the routines of daily life, numerous powerful emotions may emerge. Researchers leading the Safe Return Study conducted focus groups in four urban areas with men who were incarcerated and released within 2 years, as well as their wives and girlfriends (Hairston & Oliver, 2006). They found that resentment, fear, disappointment, and anger over past hurts were commonly expressed by these men and women. For men who have been used to suppressing their emotions in prison, communicating intense feelings, especially if they are negative, was difficult (Haney, 2001). Lack of contact can weaken bonds and impede healthy patterns of communication (Travis et al., 2005). Thus, many couples could benefit from assistance at post-release in working through these emotional struggles. Insight from qualitative studies suggests that in order to cope with the trauma of separation, much of couples’ conversations in prison focused on how things will change for the better upon release. Men talked about their personal transformations and women responded with hope and commitment to the future (Fishman, 1990). Although many of these promises may be sincere, the strains of reentry and opportunities with old friends often draw men back into their past criminal life. For women, who have held on to their partner’s promises, seeing him fall back on his old criminal patterns can be devastating (Hairston & Oliver, 2006). The odds of success after reentry are not very high: 68% of men are arrested within 3 years of their release, and 52% are back in prison for a new offense or a parole violation (Visher & Travis, 2003). In addition, one month after release, 25% of men report drug use or alcohol intoxication and this percentage increases to 35% one year post-release. Substance use resumption was related to numerous post-release problems including difficulties with family relationships (Visher & Courtney, 2007). Although many ex-offenders have a history of violence, little is known about reentry and domestic violence (Hairston & Oliver, 2006). Given the high rate of substance use, which has been consistently associated with domestic violence, it is likely that domestic violence will be an issue for a subsample of released men and their partners. African American women and those whose partners have a history of violence are at highest risk during reentry (Hairston & Oliver, 2006). In a qualitative study focused on men returning home, some ex-inmates believed violence against women was justified. Reuniting partners often face many points of conflict including suspected infidelity, differences in how children should be raised, and the threat of new relationships women may have developed during their partner’s absence (Fishman, 1990; Hairston & Oliver, 2006). Conflict—especially conflict that occurs in conjunction with alcohol or drug use—can easily escalate to violence. Perceptions of low self-efficacy in relationships have been linked to under- and un-employment which is common among released prisoners (Babcock, Waltz, Jacobson, & Gottman, 1993). Changes to men’s sense of power and self esteem that occur during imprisonment also may elevate risk for violence against women. In a qualitative study focused on men returning home, some ex-inmates believed violence against women was justified in order to gain control in the relationship (Hairston & Oliver, 2006). Violence against intimate partners is both a tactic to suppress woman’s voices and a way to vent frustration (Jewkes 2002). Intense treatment is needed for men with histories of family violence, and reunion with families should be treated with caution if women and children face any risk of emotional, physical, or sexual abuse. Not all batterers can and should be reunited with their partners; thus, family strengthening programs should include screening for domestic violence and safety planning (Bauer et al., 2007). The goal of family strengthening efforts with this population must not be reunification at all costs, but the provision of interventions in situations where there is a reasonable likelihood of benefits. Batterer interventions generally emphasize cognitive behavioral techniques and address power and control issues. Marital education approaches that emphasize skill development such as anger management, conflict resolution, negotiation, problem solving, and empathy may not be sufficient for this population. Batterer interventions based within a cognitive-behavioral paradigm target irrational “self-talk” that fuels abusive incidents. Negative/aggressive thoughts are identified and linked to feelings and behaviors. The batterer learns to pre-empt the escalation of negative thoughts using cognitive reframing and relaxation. Interventions grounded in feminist theory (Johnson, 1995) address the influence of the traditional patriarchal family structure, social constructions of masculinity and femininity, and asymmetry in male and female power (Johnson, 1995). From this perspective, men’s violence is perceived as being rooted in a need to achieve power and control (Jewkes, 2002; Tilley & Brackley, 2005). Several batterer interventions utilize the “Power and Control Wheel,” which illustrates how male power is demonstrated through control tactics such as minimizing, blaming, intimidation, emotional abuse, isolation, and economic threats. These abusive strategies are countered by teaching critical thinking skills, confrontational group processes, accountability-focused group therapy, and empathy and moral development (Healey, Smith, & O’Sullivan, 1998). However, the efficacy of batterer interventions has been shown to be modest at best (Babcock & LaTaillade, 2000). More research is needed to increase understanding of how to reduce the risks of domestic violence using skill-building cognitive-behavioral techniques, and power/control paradigms within the continuum of services provided to incarcerated men (Bauer et al., 2007). The availability of effective domestic violence prevention programming is crucial to providing a safe context for any family strengthening approaches undertaken with this population. Further empirical research is needed to understand how reentry affects the partner relationship and vice versa. Although quite informative, the limited research on this topic is predominantly qualitative and based on small, nonrepresentative samples. Although some quantitative research has focused on the protective role of family on the ex-offender, research has neglected to examine how the released offender’s attempts to reintegrate affect his partner, children, and family system. It is especially important to determine how and when conflict escalates to violence and what interventions and system changes are needed to protect women and children. Research that examines constructs known to affect marital/partner resilience such as conflict resolution, anger management, power/control, and social support need to be examined using validated scales to compare patterns across families with and without an ex-offender. Furthermore, longitudinal research is needed to examine how relationships change over time in order to identify key transitional points and mechanisms for intervention.